Women who say they have been left in financial hardship as a result of pensions changes brought their campaign to AMs on Wednesday. Campaigners, born in the 1950s, say a move to equalise the state pension age was brought in without enough notice to change their retirement plans. Plaid Cymru has called for the Welsh Government to lobby their case with the UK Treasury. UK government said it has already made concessions. It is refusing to make further changes, which it says would be costly. The issue is due to go to the courts later this year when judges will decide on the lawfulness of the way the change was implemented. Up until 2010 women received their state pensions at the age of 60, but that has been rising ever since. The current state pension age is 65 for men and women, and will rise steadily to 67 by 2028. Sally Hyman, who is 63, said she had not thought the pension changes would affect her at all "because we got absolutely no notice about it". Ms Hyman called for the UK government to look at individual cases. 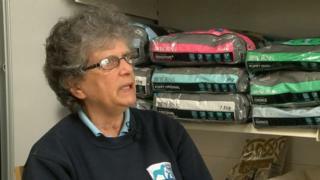 "I was made redundant, and at that time I didn't realise that my pension had changed," she said. "I've lost approximately £48,000 in pension. I'm having to dip into the savings that I thought would be there for future generations." She said many women do not have savings and are having to continue working. "The important thing is I've paid for this. I paid in, and the government won't pay out." "We had no letter, no notice, and no we've got no pension." Plaid Cymru called for compensation to be given to the women affected. In a vote a majority of AMs called for the Welsh Government to consider what action it could take in relation to the case against the Department for Work and Pensions. Helen Mary Jones, Plaid AM for Mid and West Wales, said: "This fiasco has caused retirement plans to be shattered and women who have planned and saved for their retirement are living on dwindling limited savings until they reach their new State Pension Age when the only income they will have left will be their State Pension. "The consequences of this poor implementation and communication are likely to be poverty, loss of independence and financial security, or ill health."